Freddie Brown is still the only Test cricketer to have been born in Peru. His father, a useful player himself, had a business in Lima. Brown remained in South America until he was 11, at which point he returned to England to attend a prep school near Maidenhead in Berkshire. Four years later he went to The Leys, a public school near Cambridge. In those days Brown was a seam bowler who opened both the batting and the bowling. One of the more interesting things about him is that he was born a natural left hander. His father did not however approve and insisted the youngster both bowl and bat right handed. He never saw a need to revert, but it does raise a question as to the sort of cricketer he might have become had his father not stifled his natural instincts. By 1930 Brown was 19 and at Cambridge University. He had first come under the wing of the great South African all-rounder and coach Aubrey Faulkner, whilst at his prep school. In that spring of 1930 the pair met again when Brown visited Faulkner’s indoor school and was persuaded to take up leg spin, a change sold to him on the basis it would make it more likely that he would get into the University first XI. The advice proved sound and Brown got his blue in both his summers at Cambridge, and indeed he got a hockey blue in the second year as well. Then as now degree courses lasted three years, and tuition fees were paid by the student or, more usually, his or her parents. Brown was reading Economics but, in those two years, managed to avoid passing even a single examination. He might well have been sent down anyway by the University, but in the end Brown senior decided that there was nothing to be gained by throwing more money at his son’s education, although he was still content to support him as he tried to establish himself as a cricketer. Brown had caught the eye of the England selectors in 1931 and been picked for the second and third Tests against New Zealand. The summer of 1931 was the first in which a New Zealand side with Test status had visited England and the side was not a strong one. Despite that England were unable to bowl their visitors out in the second innings of the first Test leading the selectors to discard one leg spinner, Walter Robins, and have a look at Brown in the second match of the series. The second Test was a comfortable innings victory for the hosts. Brown did not need to bat in England’s only innings, and took three of the twenty New Zealand wickets that fell. Like the first Test the third was drawn, but ruined by rain. Not even the first innings of the match was completed and as England batted first and lost only three wickets Brown did not even get to step out onto the Old Trafford turf. In 1932 the 21 year old Brown played his first full season for Surrey and, impressively for one so inexperienced, he achieved the double. His 1,135 runs included a double century against Middlesex, during the course of which he batted for a long time with his captain, Douglas Jardine. Amongst his 120 wickets there were a couple in each innings in the Test trial and Brown held his place for the only Test of that summer, India’s first ever. Under Jardine England won comfortably enough after an early scare and Brown contribute three wickets and a few runs in the second innings. His season’s work was enough to persuade the selectors to take him to Australia. Brown’s role in the famous ‘Bodyline’ tour was very much a supporting one and he didn’t play a Test until the tourists reached New Zealand where he contributed 74 to the drawn first Test. During the course of that innings he shared a partnership with another renowned hitter, left arm pace bowler Bill Voce. The pair added 108 in 45 minutes, one of the most remarkable displays of sustained hitting that the game had seen at that time. In Australia it was largely a case of watch and learn. Brown wasn’t too impressed with Bodyline, which he considered to be contrary to the spirit of the game, but at the same time he recognised it was within the laws. He was impressed by Jardine, who he considered to be a tough and astute captain. He respected the fact that Jardine would never ask anyone to do anything he wouldn’t do himself, and noted also that Jardine expected a lot from his team, and that he wasn’t always the best at communicating his thoughts. The 1932/33 tour was an immensely enjoyable experience for Brown and on his return his life changed. He succeeded in finding employment with a city insurance brokerage so he no longer had to rely on his father’s goodwill, but at the same time had the best of both worlds as his employers were content for him to take a great deal of time off in order to play cricket. He wasn’t a regular in the Surrey side but was available more than many amateurs and was also permitted to tour Egypt three times in the 1930s, for a month at a time, with teams raised by Hubert Martineau. As far as his form was concerned Brown did not get close to selection again for England until 1937 when he appeared in his only other pre-war Test, once more against New Zealand. It was an interesting match in which New Zealand managed to restrict England’s first innings lead to 78. When England then slipped to 75-7 in their second innings they were in real danger of defeat when Brown walked out to bat. When he left, just over an hour later with 57 to his name, the crisis was over and a poor second innings capitulation by the New Zealanders for 134 gave England a flattering margin of victory. In truth England were extremely fortunate with Brown, on his own account of his innings, being put down as many as four times. When World War Two began Brown immediately accepted a commission in the Army Service Corps. He may have been dealing with matters of logistics but he was very close to the front line and in early 1942 was made an MBE for his role in the evacuation of Crete. A little later, in June and by now posted to North Africa, he was taken prisoner by the Germans at Tobruk and spent the next three years in a prison camp in Italy. The bulky Brown, whose normal weight was around the 15 stone mark, lost a third of his bodyweight whilst in captivity. Post war employment took Brown into a position as a welfare officer for a firm in Yorkshire and he played most of his cricket in the hard school of the Yorkshire Council. He played a few First Class matches, mostly at the Scarborough Festival each September and, just once, for Surrey in a Championship fixture. It was in 1948 that Brown received the offer that revitalised his playing career. It was from Northamptonshire, who wanted him to take over the captaincy of a county who had been the Championship’s whipping boys for years and who had taken the wooden spoon in each of the previous two seasons. To begin with Brown was not keen, but eventually the promise of off season employment with British Timken and the prospect of a long term career with the company persuaded him to give the challenge a go. Even Brown must have been slightly surprised at how well his 1949 summer went. On a personal level, reverting primarily to the seam bowling of his youth, he did the double and, despite having no significant captaincy experience he dragged Northants eleven places up the table to sixth. So impressive were Brown’s performances the selectors were persuaded to recall him for the third and fourth Tests against New Zealand. Brown let no one down, but even he couldn’t find a solution to the problems caused by giving as strong a batting side as Walter Hadlee’s ‘49ers’ a series of four Tests, each of only three days duration. 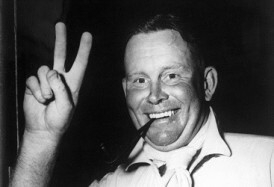 The pinnacle of any English cricketer’s career has always been to lead a side to Australia, but despite his selections in 1949 Brown could not, rising 40, have expected to be appointed captain of the 1950/51 MCC side as the selectors sought to put together a side that could improve on the drubbing that had been handed out by ‘The Invincibles’ in 1948. It is well known that Brown was not the selectors’ first choice. Above him in the pecking order were Frank Mann, who had led a successful and popular side to South Africa in 1948/49, and the then current skipper Norman Yardley. In the event neither were available and it is said that Brown forced the selectors’ hands when he came within a single wicket of leading the Gentlemen to victory over the Players at Lord’s. It was very much a personal triumph for Brown as he turned the game on its head with an aggressive innings of 122 scored out of 131 added by the Gentlemen’s last four wickets. In truth there do not really appear to have been any other likely candidates amongst the amateur ranks, other than the too old (such as Walter Robins of Middlesex and Bob Wyatt of Worcestershire), the too young (men like John Dewes and Hubert Doggart) and, in post with most of the counties, the simply not remotely good enough. At least Brown had Test experience and, by virtue of what he had achieved at Northamptonshire the previous year, seemed to be a good man manager. There must have been doubts however, which would only have been reinforced by events in the fourth Test against West Indies in 1950. Unsurprisingly drafted in in place of Yardley to lead England Brown presided over a heavy defeat, and made no significant personal contribution. The team that Brown had in Australia was an odd one. There was no Bill Edrich, persona non grata for disciplinary reasons, but it looks almost bizarre the best part of seventy years on that Jim Laker and Johnny Wardle were left at home. Brown was further hampered by two of his leading batsmen, Cyril Washbrook and Denis Compton, each having a dreadful series. In the lead up to the first Test of the series neither England nor Brown on a personal level achieved very much. At the ‘Gabba England made a good start as Australia were restricted to 228 all out on the first day. After that however it rained, and England were caught on a dreadful wicket. Despite a remarkable innings from Len Hutton in the second innings, after an Australian declaration on 32-7, Australia won comfortably enough. The second Test might have gone the same way, but in the event thanks to Brown England got to within 28 of victory. Again Australia were bowled out cheaply, this time for 194, but once more England faltered in response, slipping to 61-6. It was at that point that Brown took charge and decided to put bat to ball. He scored a counter attacking 62 and with wicketkeeper Godfrey Evans following his lead with 49 England got themselves to 197 and a slender lead. In the Australian second innings Brown ripped out the Australian middle order as he took four wickets as the home side slumped from 131-4 to 156-8 before, eventually, being all out for 181. Sadly for England they fell 28 runs short of their modest victory target of 178. Throughout the tour no one quite worked out what Brown’s gentle seamers were all about. According to the Australian batsmen he barely moved the ball at all, and even his teammates reported that the skipper just ran up to the wicket, let go of the ball and hoped for the best. But he ended up with 18 wickets at 21.61, so was clearly doing something right. Australia won the third Test by an innings, but Brown top scored in England’s first innings with his highest Test score of 79. He also bowled 44 overs and took 4-153 in the Australian innings. In addition, despite by now being a man of some personal bulk, Brown set an example in the field to his younger and more agile charges and as the series progressed the England ground fielding improved markedly. The fourth Test was another heavy defeat for England and a personal disappointment for Brown who accomplished little with bat or ball. To rub salt in the wound he was involved in a car crash after the close of play on the fourth day and did not bowl in the latter part of the Australian second innings nor bat in England’s second innings. The final Test was a happier occasion though as England finally registered their first victory over their oldest enemy since 1938. Brown did not score many runs, but his return of 5-49 in the Australian first innings set England on their way. For a man who was very much a throwback to the old fashioned English amateur Brown was surprisingly popular in Australia. ‘Tiger’ O’Reilly, as egalitarian in outlook as any Australian wrote that Brown did a magnificent job both as an individual unit of the Test team and as Captain of it. His unstinted devotion to his job and the unselfish manner in which he delved in with a will when the going was hardest won the admiration of all Australian enthusiasts. O’Reilly was not alone in his praise. His contemporary in the Australian team, and one of the very best Australian writers was Jack Fingleton. Fingo’s verdict was that Brown inspired his team by his own refusal ever to give up a losing fight. That, for our money, is what makes a real cricketer. For Ray Robinson Brown soon established himself as the hero of the season. As a man who invariably wore a white sunhat and a ‘kerchief knotted round his neck there was something of Jardine about the way Brown approached his job. Unlike Jardine however Brown did not hate Australians, and was a hail fellow well met trencherman wherever he went, the best measure of Australian attitudes to him being in the famous words of a Sydney barrow boy; Fine lettuces, fine lettuces, hearts like Freddie Brown! Not all of his own team were quite so impressed with Brown, a 19 year old Brian Close being amongst them. Close, who had a wretched tour, was deeply critical of Brown and the senior England players, although a Jardinian failure to communicate may well have lain at the root of that. One wonders what Close’s attitude might have been had he known he was only on the tour because Brown expressly wanted him rather than Jim Laker. It is also the case that a closer examination of what Close has to say on the subject illustrates that it was more the senior professionals and particularly vice captain Denis Compton who he felt led down by, rather than his captain and the tour manager. Whatever misgivings some on his own side might have had Brown certainly had the confidence of the MCC and on his return was made a selector as well as reappointed for the 1951 series against South Africa. England lost the first Test but won three of the remaining four to take the series. Brown’s contributions with bat and ball were modest, but he made a couple of important scores in the forties and took some useful wickets. It might have been expected that 1951 would’ve been the end of Brown’s Test career, but he did play once more, finally a home Test against Australia in 1953. As Chairman of Selectors there were many who thought it odd that after a drawn first Test he should come in and play under Len Hutton, particularly as he had already announced that the 1953 summer would be his last. Already faced with the considerable twin pressures of being his country’s leading batsman and first professional captain Hutton now had the Chairman in the team as well although that had, apparently, been at Hutton’s suggestion. In the event England might well have lost the match, but for a famous partnership on the last afternoon between Trevor Bailey and Willie Watson. As for Brown he contributed innings of 22 and 28 in trademark style. In the first innings he looked sound enough until Ray Lindwall decided to bend his back and was far too quick for him. He also took four wickets in the Australian second innings, all with his leg spin, but it was clear he was now too old, and he did not retain his place for the third Test. After he finished playing the game Brown remained involved in cricket. He managed MCC sides to South Africa in 1956/57 and to Australia two years later. The South African tour was drawn, England taking the first two Tests and the home side the last two after the third match was drawn. Brown had to contend with his skipper, Peter May, having a very poor series with the bat and, to be fair to him, seems to have been supportive of the plan for Johnny Wardle to bowl his wrist spin, a move that resulted in a rich harvest of wickets. The 1958/59 series in Australia was, however, a disaster. A powerful looking England side lost 4-0 and amidst a poor team spirit many were disenchanted with the autocratic way in which Brown tried to run the tour. Particularly poor was his relationship with Jim Laker. Well aware that it was in large part down to Brown that he had missed out in 1950/51 Laker was furious when, as he saw it, Brown accused him of malingering when he expressed concern about his spinning finger. But it wasn’t just Laker. Fred Trueman and Tom Graveney were also critical, and skipper May whilst not exactly taking Trueman’s side in his spat with Brown, certainly didn’t back up his manager. Whatever the rights and wrongs of 1958/59 Brown was not asked to manage any future tours, although he did manage the Rest of the World Team that was gathered together to play five ‘Tests’ in England after the cancellation of the 1970 South African tour. Given the spirit in which the Rest played and the strength of the players at Brown’s disposal it seems unlikely that the task would have proved a taxing one. Having carried out his last team management task so well a couple of years later Brown was invited to be President of the MCC, and over the years he held a number of other important positions within the game. He lived on until 1991 when he died in Wiltshire at the age of 80. Trevor Bailey, another with whom he fell out in 1958/59, contributed a warm obituary to The Cricketer, so whilst he was certainly a source of the occasional spat over the years Brown was clearly not a man to carry ill-feeling for very long.